I had the pleasure of interviewing David Newman, a fantastic marketing consultant, coach, and author of Do It! Marketing: 77 Instant-Action Ideas to Boost Sales, Maximize Profits, and Crush Your Competition. The book is all about taking a tactical approach to marketing and offers actionable ideas that you can implement today. David reveals his reasons for writing the book, what tools are most useful for him, and why you need to make your business a FLOP in order to succeed. Jay: I see your book over your shoulder, and rightfully so. You are the author of a fantastic book that continues to sell day after day on the Amazons. It is called “Do It! Marketing: 77 Instant-Action Ideas to Boost Sales, Maximize Profits and Crush Your Competition”. The book has been out almost a year. In fact, you’re having a book-iversary, so to speak. It is a book birthday this week, right? Is it the book’s birthday? David: It is, yes, yes. June 5. Jay: I was very delighted to work with you when you put the book together. I’m so happy that it continues to sell so strongly. It absolutely should because it’s a barn burner. We talked about 77 sort of instant-action ideas. What do you mean by “instant-action ideas”? David: Well, there are a lot of books out there that talk marketing theory. They talk about the why, they talk about the how, but they don’t talk about the “Okay, now what?” So what I did, and this is similar to both of your fabulous books, by the way, I wrote the book that I myself wanted to read. It’s the action-oriented ideas that I use every day to market my business, sell, develop an audience, etc. Jay: You talked about the offline and online. I think that’s really fascinating. Do you find that people who read the book, or people that you work with on a consulting basis, have more of a struggle with the online tasks or the offline tasks? David: Well, they probably have a struggle just with sales and marketing. One of the key things that I put into the book is I don’t care what kind of executive or entrepreneur you are or what you do or the core of your work. Our job, job number one is to be marketer-in-chief and salesperson-in-chief of our career, of our company, and of our business. All of a sudden, the marketing and the selling yucky-ness disappears. Because the reality is, as per the book, there are at least 77 tactical things that you could or should do in terms of sales and marketing. I feel that a lot of people who are entrepreneurs, use the title “entrepreneur” as an excuse to not be good at tactics. companies can learn from the small companies and the entrepreneurs, and what can the entrepreneurs learn from what the big companies are doing? but I don’t have time for that.” I hear that a lot from executives on my side. I don’t work with too many entrepreneurs, but a lot of executives. They say, “Well, I don’t have time to be doing all that Twitter. I got a girl to do that.” What do you say to them? raising, development, cause marketing. All this stuff. Because, obviously, I’m doing it for her. But the point is, as a solo-preneur, I know you’re running an empire, so you’re not solo anymore. Jay: I think the answer is, it’s hard to say this, but the answer is you got to work harder than you think you do. You could spam the world. You could send out your 10 million emails. You could paper the wall with your direct mail and your postcards, and your campaign letters. But every single day, those kinds of old-school tactics are getting less and less and less effective. The stuff that you teach and the stuff that I teach with some of the online components is getting more and more and more important. “Yeah, it’s easy, but how is that working for you?” Right? Imagine five years from now if you don’t get on the bandwagon and don’t start getting your house in order, now. So if what you were doing five years ago isn’t working, well, why would you wait another five years to do something about that? David: “Ancient Chinese wisdom is correct,” says Confucius. Jay: What is your advice, both in the book and in person, if somebody comes to you, “David, I really need to get going on all this.” What do you tell them is the first step? What is the very first thing you should do? David: Well, first they should read your books. Second, they should read my book. My philosophy both in the book and in real life is, number one, focus on the who. You can’t boil the ocean. You can’t market and sell to the world. So, figure out who is that sub-niche, who is that slice of the world, who – whatever your product, your service, or your program is. Who needs it more greatly? Who suffers from it more deeply? Who is going to value it more highly? Because that’s the slice of the world, that’s the slice of the universe that you can own and dominate and penetrate and identify, and start to serve. problems, heartaches, headaches, challenges, and gaps that your product and your service and your program are brilliant at solving. Chinese wisdom, “If you’re going to sell fire extinguishers, first show the fire”. They’re not going to pay money because “Oh, it’s a great product, it looks really good.” or “Oh it’s a great service, it looks really good”. People buy things to solve problems. They can be emotional problems, intellectual problems, financial problems, problems with my kids, problems with my car, problems with my hair. I no longer have a lot of hair problems but anyway. It’s pretty simple. I wake up, little bit of mousse, little bit of you know, whatever. But seriously, start to speak in the vocabulary of problem-solving and then resolve those problems. Solve bigger problems, you get bigger checks. That’s true whether it’s a product, or a service, any sort of business-to-business, business-to-consumer, etc. If they were starting from square one, the two first things I would do are, identify your “Who?” identify the who, critically important, and then identify those urgent, pervasive, expensive problems, because that’s going to open the floodgates to the marketing conversation and the sales conversation. Then, more importantly, you’ll never be at a loss for words, for what to say or how to say it, because now we’re in a conversation. Now we’re just talking. “I need to enter the conversation that is already going on in your mind so that we resonate.” The only two purposes of marketing, in my opinion, are to convey two, and only two, ideas. Jay: It’s funny, two things that you mentioned there really resonate with me. I was giving a presentation yesterday in Utah. I was talking about that same principle of understanding what the real need is. The real need is not usually your product. Your product is a means to an end. What I said was that, “Nobody in the history of the world has ever needed socks. But everybody in the history of the world has needed their feet to be warmer.” That’s the kind of thing that you were talking about. You have to understand what the big picture really is. There’s a great Zig Ziglar premise, which is that the most effective kind of sales and marketing thing ever is the similar situation sale. Right? Part of the challenge, I think, and I’m sure you see this, is that a lot of business people, especially entrepreneurs, want to try and attack too big of a section of the market. Figure out who the people are in the world who will say, “That is the best blog. Of the 500 million blogs out there, that’s the best one.” Who are the people that would say that, and write for those people. Don’t write for anybody – you’ll get some other people, but only write for those people. your own dreams. To say, “Here’s where I want to be, but to get there I actually have to start here.” That is really, really hard to deal with, especially for entrepreneurs. it’s has all been downhill since. effective social platform for you in your career, and why? David: Wow, what a great question. Well, I’m also a firm believer, when you say, “Kind of rein it in and be the favorite blog for this kind of thing”. I’m not a big believer in “Dominate every social media platform”. So I’m active on a very small handful. I’m active on Facebook. I’m active on Twitter, and then also on LinkedIn. Now, I have a presence on all the rest of them. So, yes, I’m on Instagram. I’m on Tumblr. I’m on Pinterest. LinkedIn is great for direct prospecting. It’s really about targeted prospecting, so I love LinkedIn for that. Facebook is a humanizer. Anytime I try and do something straight business, like promote a webinar, even if it’s free, even if it’s free. Promote my blog, promote the webinar, Facebook couldn’t care less. It’s just like, “Nah, we’re not doing that.” If I say, “Hey, guys, I’m going to my in-laws in Reading, Pennsylvania and I’m doing a yard sale. Do you have any tips?” I’ll get 30 likes and 57 comments. Everyone wants to help David with the yard sale. No one cares about David’s webinar or David’s coaching program or any of it. Then so, finally, I find that Twitter is a huge driver of traffic. It’s not good for sales. In fact, there is no social media channel that is good for sales. I write about that and you write about that. The most idiotic thing, Jay, that I ever hear is, “Instantly grow sales with social media.” It’s like “Hmmm, no, no, no.” We’re not going to instantly grow any sales with social media. So, Twitter is a great source of traffic, for me. You look at your web stats to see where your traffic is coming from. Some is organic. Some comes from Google. Some is from Twitter. 15 to 20 percent of my traffic on my website, on my blog comes from Twitter. That’s because I am just a Twitter machine. I use great tools like Buffer, TweetAdder, and some of these tools to automate. My belief in social media, by the way, is automate and humanize. Number one, don’t be everywhere. It doesn’t make sense to invest and spread yourself so thin that you’re everywhere. Take your two or three social media platforms and figure out which ones are best for which application. If you’re in a certain niche, if you’re going after a certain demographic, yes of course, Pinterest is great. Instagram is great. Tumblr is great. Snapchat, Vine, all that stuff is great. But don’t let the tail wag the dog, is the other thing. Figure out strategically why are you there. What do you hope to accomplish? “Sales” is never a good answer, by the way. Then just figure out, what, as a small business owner, as an entrepreneur even, as a corporate entity, figure out what is the best fit for your goals and that platform and that audience. Because if your audience isn’t there, you shouldn’t be there if you’re hoping to develop business. I see this a lot. People say, “Well, we’re everywhere and none of it is working.” Well, do less. Do less marketing, less social media, and you’ll get better results if you focus it on where your folks are and you use it more strategically and more programmatically. Jay: You’ve been in business for a while. I’ve been doing this for a while. Looking back, what do you wish you knew then, that you do know now? What would you tell young David Newman about business and marketing? David: I just recently figured this out, last two or three years. I’ll be totally up front about that, and part of it is us doing this interview. I’m a huge Tom Peters fan. One of the first things he implemented is a little feature on his blog called “Tom’s Cool Friends”. I was like, “Oh my God. What a great idea. Tom’s Cool Friends.” He would specifically and intentionally shine the spotlight on other experts, shine the spotlight on other thought leaders. 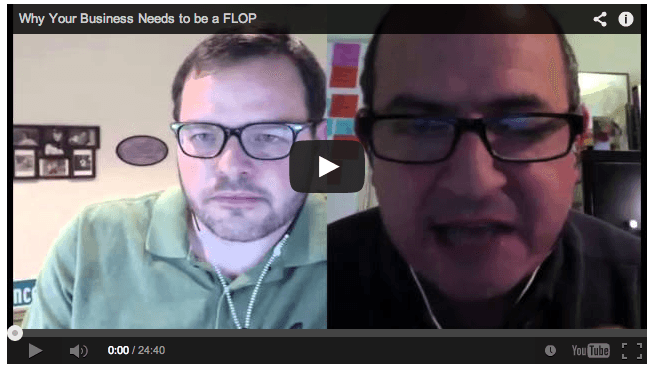 I have a blog post out there called “Why your business needs to FLOP”. FLOP is an acronym for Feature and Leverage Other People. So, my business FLOPs. Your business FLOPs. Whether it’s a company of one or a company of 10,000. Figure out how can you FLOP, how can you Feature and Leverage Other People, because that’s going to raise your profile, raise your expertise, raise your level of trust, and raise your level of Youtility.